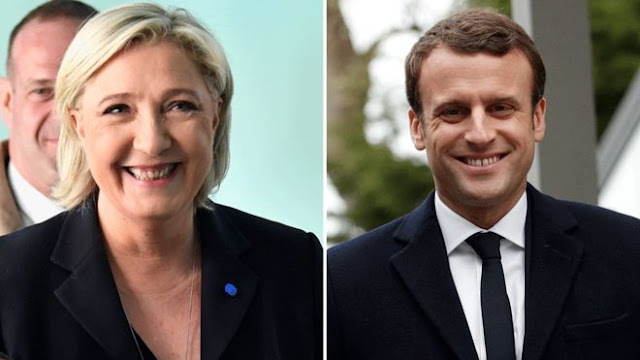 The centrist Emmanuel Macron will face far-right leader Marine Le Pen in a run-off for the French presidency on 7 May, multiple projections indicate. An Ipsos/Sopra Steria poll puts Mr Macron on 23.7% in first-round voting with Ms Le Pen on 21.7%. Opinion polls have consistently predicted Mr Macron defeating his rival in the run-off. Another projection, from TF1/RTL, put Mr Macron and Ms Le Pen neck and neck in the first round. With more than three-quarters of the vote counted, official results put Mr Macron on 23.23%, ahead of Ms Le Pen on 22.83%. Results are still coming in from big cities where he has greater support. Whoever wins the next round, the voting marks a shift away from the decades-long dominance of leftist and centre-right parties in French politics. While Ms Le Pen has long been seen as likely to make the second round, Emmanuel Macron's rise has been swift. The BBC's Hugh Schofield says Mr Macron's likely victory is the story of the evening. He told cheering supporters "we have changed the face of French political life in one year", calling for people to rally against "nationalists". A former banker, Mr Macron served as economy minister under current President Francois Hollande, quitting to launch a new party. He has never stood for election before and if he wins would become France's youngest-ever president. A pro-European, he has called for gradual deregulation of France's economy and a multi-billion dollar public investment plan. As the projections came in, Ms Le Pen called herself "the candidate for the people", saying that the "survival of France" was at stake. "The first step... has been taken," she said. "This result is historic." Ms Le Pen leads the Eurosceptic, anti-immigrant National Front party. She has attempted to soften the party's tone and brought big gains in the 2015 regional elections. She has urged a shake-up of France's relations with the EU, calling for negotiations followed by a referendum. Ms Le Pen also wants immigration to be slashed and the closure of "extremist" mosques. Mr Macron is widely seen as favourite in the final round of voting, and in a sign of the uphill struggle Ms Le Pen faces he soon won high-profile endorsements. Admitting defeat, François Fillon, whose campaign was rocked by corruption allegations, said there was "no other choice" but to vote for Mr Macron. Projections give him around 19% of the vote, the same as Jean-Luc Mélenchon, who has so far only said he and his team do not "acknowledge the result on the basis of polls". Benoit Hamon, the candidate of President Hollande's Socialist party said "I encourage everyone to fight as hard as they can to fight the extreme right, and to fight for Macron". He endured a difficult night, forecast to win just 6%. Both Germany and the EU also offered praise for Mr Macron. Turnout nationally appears to be similar to the last election in 2012, at about 80%. Almost 47 million people were eligible to vote. Nearly 60,000 police and soldiers were deployed across the country to secure polling, with France still reeling from the shooting of a policeman on the Champs Elysees.